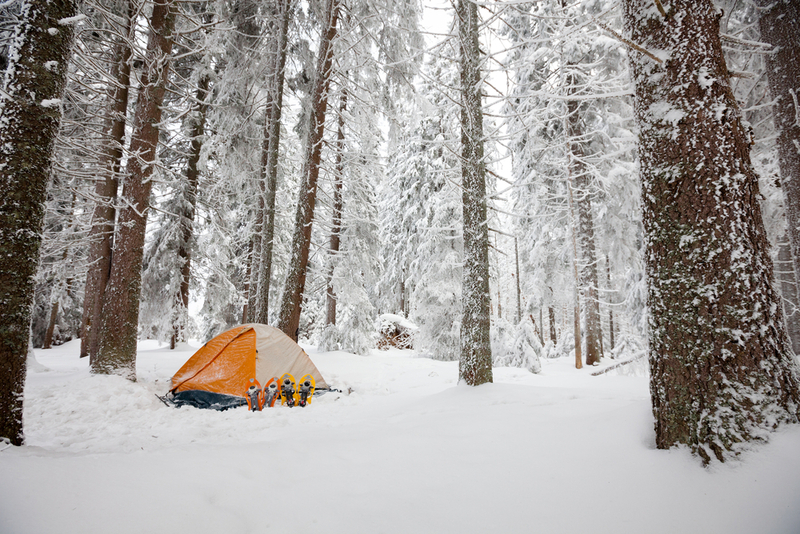 Camping in any weather can be difficult, but cold weather camping can be some of the most grueling. If you are considering a trip up north this fall or winter to camp in the great outdoors, you need to know just what to bring with you to stay safe, comfortable, clean, and prepared. Preparing for a cold weather camping trip can be a daunting task. Since you will need additional clothing to stay warm, your pack can quickly fill up. Combat One has a list of the most important items you will need to bring with you to safely camp in a cold environment. It may seem obvious that you need to pack warm clothing, but it can be easy to forget when it comes time to pack—especially when it comes to extras. Don’t just pack a coat, gloves, and a hat—bring two of each. If you happen to get wet, having extra clothing will allow you to get into dry clothes and prevent frostbite or hypothermia. There may also come a time when the wind and snow make it cold enough that you need more than one coat or pairs of gloves. Having extras is always a good thing when the weather can quickly become more brutal than expected. We also recommend wearing thermal underwear for additional protection against the elements. If you aren’t sure about wearing thermal underwear. Pack them and put them on if needed. You will need something to sleep in to protect you from the elements. In extreme cold, you should bring a tent and an insulated sleeping bag that is rated for at least 10°F lower than the coldest temperature you will deal with while camping. A sleeping bag liner will also provide more warmth. Sleeping pads can also be very useful, but they are more difficult to carry around. If you have extra space, we recommend using two full-length sleeping pads to provide comfort and additional insulation. Since lying on the cold ground will cause you to quickly lose body heat, having sleeping pads under you will help you retain more body heat. Look for sleeping pads with high R-values, which signify a higher insulating power. Fire is one of the most important things to people who camp in cold climates. Not only does fire allow you to have clean water, but it also allows you to cook food and keep warm. Without fire, it can be extremely difficult to survive. Instead of worrying about a water filter, boil snow to get drinking water. Not only does this eliminate an extra item to carry—an experienced camper would already be bringing a pot—but it also generates warmth throughout the process. Staying warm in the bitter cold and wind can be extremely difficult. Fire may be the fastest way to warm up. Bring the tool or tools you are most comfortable using to start a fire. If you are bringing matches, store them in metal to prevent damage to the matches and bring way more than you think you will need. Matches aren’t foolproof and they don’t always strike properly. Bring enough food to last you for at least one extra day and have a way to create clean water. If you have followed our advice from the previous point, you will be able to boil snow to get clean water. Be sure to bring a water bottle that can hold the water you boil. If there is no snow or other water source that you can boil in the area you will be camping in, you will need to bring water. Water can be heavy to pack, so be mindful of how you want to carry it and how much water you will actually need. When packing for a trip of this nature, you want to pack food items that are lightweight, but nutritious. Consider packing protein or meal bars or ready-to-eat meals (MREs). Energy gels have also become increasingly popular for campers, because they contain both carbohydrates and caffeine. There are hundreds of options for food to eat while camping, but many people still like to hunt for their food. While hunting will provide you with meat, you will need other foods as well. Make sure you bring food to supplement other nutrients. Regardless of what you pack for food, you will want it to be lightweight, highly nutritious, and easy to eat in the wilderness. To truly be prepared for anything, bring a first-aid kit with you on your trip. Accidents happen; you need to be prepared to treat minor injuries on the go. A small first-aid kit won’t take up too much room in your pack, and it is essential for a safe trip into the wilderness. Be sure to pick up a camping specific first-aid kit, because the ones for your home won’t contain the supplies you may need when you don’t have quick access to medical treatment. Your kit should have supplies for cuts, bleeding, burns, and sprains. It should also contain medications that help with stomach aches, headaches, and dehydration. Combat One’s Tactical Bath is the perfect option for cold weather camping cleanliness. Since it will be far too cold to get wet, you need a solution for getting clean that won’t put you at risk for frostbite or hypothermia. Combat One’s Tactical Bath Wipes will help you remove bacteria from your skin without soap and water. If you will also be hunting for your food while you are camping, these wipes can help you clean up after skinning and cleaning your food. Animals are covered in bacteria that could cause disease, and you need to be able to get rid of that bacteria on your skin. It isn’t convenient to carry around soap, clean water, and a towel, but Combat One’s wipes are lightweight and easy to carry. Hand sanitizer isn’t a good option while hunting and camping either, which makes Combat One Tactical Bath one of the most important items in your pack. You may encounter things while camping that you never anticipated, so you need to be as prepared as possible when venturing out. Having a knife or similar tool can help you skin an animal or cut firewood. Bring something that is large enough to be useful, but not too big to be a burden to carry around. Make sure you also have a safe way to store your knife, as unexpected injuries are bound to happen when they are improperly stored. One of the worst things that can happen while you are cold weather camping is getting lost. If you wander away from your tent and other supplies and can’t find your way back, having a map or GPS can help you get back to your camp. We recommend bringing a map, GPS, and/or compass to help you navigate while you are camping. If you bring a paper map, be sure that you put it in some sort of protective case to prevent damage in the event that it gets wet. If you leave your campsite or move campsites, be sure to take your navigation method with you. As silly as it sounds, sun protection is extremely important even during winter months. Snow can amplify the sun’s rays, which can cause you to get a sunburn even more quickly than you would in the summer. The combination of the higher altitude and the reflection of the UV rays makes the chance of sunburn much higher. Since both snow and wind can cause sunscreen to wear off more quickly than normal, you will want to be sure to apply sunscreen to exposed skin often. Apply at least every 90 minutes. You also need to protect your eyes from the sun. Wearing sunglasses or goggles can prevent eye damage when the sun’s rays are intense. Goggles can also help keep the wind out of your eyes. Ski masks are another great way to cover up skin. A ski mask would likely eliminate the need to carry around sunscreen while you are cold weather camping. With these nine items, you are ready to get started off on your cold weather camping adventure. While this isn’t an exhaustive list of the things you should bring with you while camping in a cold climate, it is a list of the essentials. If you have room, pack other convenience and comfort items, too! To learn more about Combat One’s total body hygiene system, visit CombatOne.com. Combat One offers a couple different ways to keep clean on-the-go without traditional hygiene products.